It certainly started off well. That's why we're really shocked that this (7 Man,1 Woman. Minus 1 Recused Councilman) City Council was apparently unmoved by the speeches from individuals who are ACTUALLY experiencing drilling operations RIGHT NOW within a few feet of their backyards. They seemed so disengaged or maybe they were just confused during the 3 1/2 4 hour meeting. The proposed changes to the Grand Prairie Gas Drilling Ordinance had some excellent ideas put forth by City Staff. One of those included a 1,000 foot setback with only a possible 700 foot variance. This City Council doesn't seem to be very informed at all about shale gas drilling. People came to the microphone, poured their hearts out and then members just sat there like zombies. (Update: Maybe that's too harsh, and they just didn't know what to say.) The new Ordinance left out those most crucial parts the Westchester-Community Alliance requested. Namely, a Public Overview and/or a Specific Use Permit required for each and every well site going in. So, after all the speeches (mostly in SUPPORT of the new Ordinance as presented during the Work Session last Tuesday AND posted on the Web site) there was a vote on tabling this "Earlier Revised" Ordinance so that we could have more time for feedback. That one didn't make it. And then there was another vote for going with a 700-foot setback with a 500 foot variance (presented at the 4:30 PM City Council Session). That one passed. And then the BEST Part. They kind of went right to a vote to lift the 6-Month Moratorium. WHOOSH. Over and Out. 1,000 foot setback becomes 700. But the biggest kicker of all is how each and every gas operator that spoke tonight mentioned all the meetings they had with Environmental Services about the Ordinance during this hurry-up process. We're really not a TEAM. We ARE Chesapeake. GREED. Play to the greed! It's all about the money. And that's really funny, since the average royalty payments over to our West are coming in at around $35 per month for the average resident. If at all. Ask Gary Hogan with the North Central Texas Communities Alliance. He'll be at City Hall tomorrow night. Just ask him what his royalty payments are over in the "heart" of the Barnett Shale. Is $35 a month worth the loss of your property value, your health and the transformation of Grand Prairie residential communities into shale gas drilling industrial zones? It's already happening. Just ask your neighbors in Trailwood. Better yet, drive over to see it for yourself. Matthew Road between Bardin and Polo. You can't miss the industrial zone that used to be a cow pasture. It's so sad what they've done over there. Come on down to the City Council Meeting at 6:30 PM. Be early if you can. We hear that Grand Prairie large landowners will be there to defend Chesapeake. We wonder if that will include our own City Councilman?? And be prepared to stay late. It should be very interesting. Come on down. Talk to the "small" group of Grand Prairie residents who have spent the last 7 months learning all they can about this shale gas drilling campaign in Grand Prairie, TX. Room with a View: Flashback! Update: This Monster FRAC Pond was plowed up (*cough* *cough*) and moved a few feet south just two weeks ago and now sits 150 feet from the backyards of Westchester Valley neighbors: neighbors who have NOT signed mineral leases. It had been measured at just 10 feet from our neighbors' backyards when this picture was taken on September 16, 2010 ~ I guess everything is all better, now. 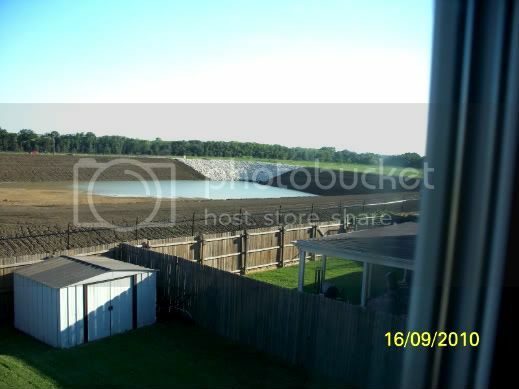 Seems to us that even if you don't sign a MINERAL LEASE with Chesapeake, you may just end up with a Monster FRAC Pond in your dining room and/or a Pad Site in your backyard. Because Whatever Chesapeake Wants, Chesapeake Gets. Homeowners Beware!! Front Page of the Grand Prairie, TX City Web site. We requested that the Ordinance go online. And there it is ~ a link to the *Proposed" newly revised Grand Prairie Shale Gas Drilling Ordinance. It will be voted on this Tuesday night, January 18th, by City Council at City Hall beginning at 6:30 PM ~ following the Public Hearing. Take a look and see. It's a far cry from what it was. It appears that the Ordinance is still not allowing for a Specific Use Permit through P&Z ~ a #1 priority for this Westchester Neighbor. Of course, we're glad to see the 1,000 foot setback for Protected Use Properties including homes, schools, churches. The current setback is 500 ft. The proposed Ordinance allows for a "variance" from the 1,000 foot setback to no less than 700 ft. if approved by City Council after a Public Hearing. And there's a requirement that the Permit from a gas operator provide detailed information about all drilling equipment including pipeline construction. Take a look and see what you think. Correspondence sent by Chesapeake to lessors in Grand Prairie, TX (those who have signed leases allowing Chesapeake to extract the shale gas from under their property) requests that they attend the meeting in opposition to the proposed Shale Gas Drilling Ordinance. AND that they not listen to the "activists" or the "protestors." (Laura Patton misspells the word in the correspondence.) Maybe "protestors" are different than protesters. Not sure. I guess we'll see what happens Tuesday night. Part II: "We Don't Want No Moratorium"
Back in the summer, July 19th, to be precise, there was a Westchester Town Hall Meeting about the shale gas drilling issue. Flyers were distributed all across the area, signs were posted, panelists were invited. These panelists included: Gary Hogan of the North Central Texas Communities Alliance, Sharon Wilson of the Oil and Gas Accountability Project, Mayor Calvin Tillman of Dish, TX, Cherelle Blazer of the Environmental Defense Fund, Jim Cummings, Environmental Services Director for the City of Grand Prairie, Ron Jensen (City Councilman for District 6) and Laura Patton representing Chesapeake. Before that meeting got underway, we were greeting neighbors as they arrived at the Oaks Baptist Church and asking people to sign the Petition for a Moratorium on all gas drilling activities. We had decided that the current Gas Drilling Ordinance was in need of stronger protections for our neighborhoods. A man came to the table, picked up a petition and then yelled out, "We Don't Want No Moratorium." Later, we discovered that this man was either a landman for Chesapeake or in some way connected with that company. He clearly had a vested interest in stopping our efforts. Keeping all of that in mind, here is Part II of the Chesapeake Town Hall Meeting held on December 7, 2010 in Grand Prairie, TX. After Blowing a LOT of Hot Air! Environmental Services Director, Jim Cummings. Chesapeake reps Gas company contractors said they were "overall" very happy ~ especially with Greg Giessner and Mark Hepworth. Must have had something to do with their wanting to keep the minimum setback for pad sites at 500 ft. Apparently, Councilman Giessner (At-Large Rep for Grand Prairie, TX) and Councilman Hepworth (District 1 Rep for Grand Prairie's Northern Sector) are Chesapeake's shale gas drilling contractors' new best friends. That's OK. To each his own. Westchester-Grand Prairie Community Alliance would like to especially thank Mayor Charles England for his statements that were very supportive of the concerns of the Alliance. Thank you, Mayor England. Some politicians just don't get it. But that's what elections are for. P.S. Chesapeake Shale gas contractors may want to know that members of the Grand Prairie community who are very informed about shale gas drilling sometimes go to Theo's. And sometimes they can't help but overhear conversations at adjacent tables. Just a few points to ponder. *Correction: Apologies to Chesapeake Energy. We cannot confirm that the contractors were associated with Chesapeake. They were dressed very nicely and looked very professional. They certainly didn't sound very professional. So, it's good to know (from Laura Patton, Public Affairs Supervisor for the City of Grand Prairie/Chesapeake) that none of their reps were at Theo's Tuesday night. WHEW! "Mayor England stated that a Council workshop is planned for January 11, 2011 to discuss the draft gas drilling ordinance." So, the question is: Why haven't informed citizens of Grand Prairie been invited to participate in this "Workshop"? As we understand it, this event is only a discussion among City Council members. We are very surprised that citizens will not be allowed any input. 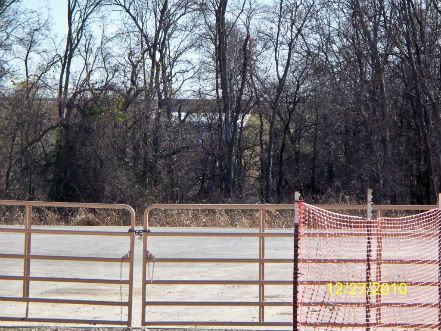 Especially since we also understand that the new "Grand Prairie Gas Drilling Ordinance" may be voted on during the Public Hearing to be held only one week later ~ on January 18, 2011. And since this is one of our primary issues ~ that citizens have not been allowed any input into the Shale Gas Drilling Ordinance decisions ~ we are very disappointed with the unfolding events. We also understand that many of the issues that were proposed during the Environmental Services Public Meeting on August 31, 2010 are not being addressed. But this is just what we "hear." We wonder if two of our biggest concerns are being addressed: Shale gas drilling should be part of regular Planning and Zoning Review via SUPs (Specific Use Permits) AND a Gas Drilling Advisory Commission should be appointed (composed of informed citizens). The Westchester-Grand Prairie Community Alliance compiled a document for consideration by October 1st (as requested). After submitting this document, we have not received any direct communication from the City for our efforts. Even with the current "6-Month Moratorium," we have no choice but to believe that this Moratorium may have been little more than a publicity stunt. As of this date, citizens of Grand Prairie have not been "invited" to the table to discuss shale gas drilling in our communities. And we have a lot to share. The report recommends an agency overhaul and the abolishment of the three commissioners, to be replaced by a five member appointed board. "Civil Disobedience is the Opposite of Terrorism." ~ Josh Fox, Director of "Gasland"